MUSIC TYPE Guitar driven rock/blues. Young and raw, with a rock edge and funky bottom end, Rynsaardt have created a storm over the last year, for their earthy mix of biting rock and soulful blues driven by a distinctive guitar sound. Onstage, Rynsaardt are known for the passionate and immediate performances of front man Jan Rynsaardt, whose intimacy and energy captivates audiences wherever they play. Together for just 12 months, the band has established themselves at events such as the Great Southern Blues & Rockabilly Festival, Husky Blues Fest and on Sydney’s infamous blues stage, The Empire Hotel. 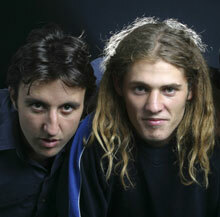 November 2003 will see them appear at WA’s prestigious Blues At Bridgetown Festival, supporting the John Butler Trio.